This month’s Science of Forming column is number 200. To celebrate, let’s take a historical look at the major technological advances that have allowed the properties and characteristics of steel to continue to improve. Go back to 1940, when molten steel was primarily made using the open-hearth process. After a long “cooking time” activated by overhead combustion of gases, molten steel drained into ladles and was poured into molds. These thick molds stood on railroad flat cars to be moved from pouring stations to cooling areas for solidification. Each mold produced one master coil. This steel, called rimmed steel because it boiled and circulated in the mold as it cooled and solidified, had a major problem: it aged with time. Specifically, its formability properties changed over a three-month period, so it had to be used shortly after receipt from the mill. Also in 1940, aluminum-killed draw-quality (AKDQ) steel began to become popular with some users, while others remained cautious and undecided. Before AKDQ steel was poured into the molds, it was “killed” with aluminum shot—no boiling and circulating. Its major advantage: no aging with time. Steel properties measured with a tensile-test machine included work-hardening exponent (n-value), strain-rate hardening exponent (m-value) and anisotropy ratio (r-value). While available, these properties were seldom utilized. The 1960s welcomed major changes in steel processing. The basic oxygen furnace (BOF) began to replace the open-hearth furnaces. These new furnaces (Fig. 1) could hold 100 to 350 tons of molten metal from the blast furnace, plus some steel scrap. The top of the vessel remains open to allow an oxygen lance to enter and blow oxygen into the molten metal at supersonic speeds to melt all of the metal and reduce the amount of carbon and other elements. The BOF reduced process time from one day for the open hearth to about 1 hr. Another challenge at the time was converting 300-plus tons of molten steel per hour into slabs that later become coils of hot- and cold-rolled steel. The industry developed the continuous-casting (concast) process to keep pace. The most common casting machine (Fig. 2) begins the solidification process via an oscillating mold high above the mill floor. A ladle of molten steel from the BOF moves over the mold and a controlled flow of molten steel fills the mold. 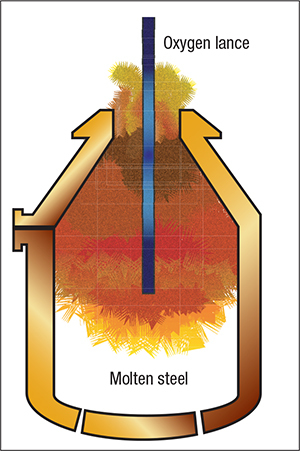 Molten steel exits the mold as a final slab; a thin skin of solidified steel is sufficient to contain the molten center. As this continuous slab moves down toward the floor, rollers start to curve the slab from vertical to a horizontal direction. Water sprays the steel along its entire journey from mold to cutting table at the floor level to accelerate the cooling and solidification process. Combining the BOF and concast process yielded a superior product with consistent composition throughout the 300-ton (or more) batch. The slab lacked any of the front-to-back variations found in single coils of steel cast in individual molds. 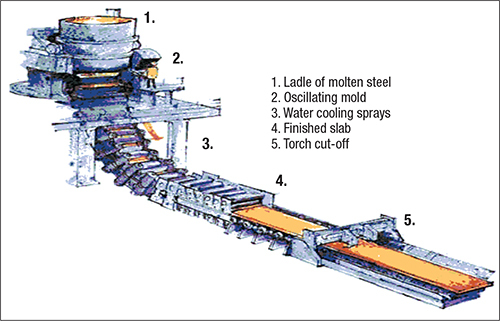 Since the oscillating mold could not tolerate boiling molten steel, concast steel had to be killed steel. Thus, the production of rimmed steel had ended. Mills developed metallurgical control stations to modify specific heats of steel—testing, vacuum degassing, adding chemicals, etc. Thus began the age of high-strength low-alloy (HSLA) steels. The metallurgists of the 1970s realized that heating and cooling steel to different temperatures at various speeds (such as fast quenching to produce the martensitic phase) could create a whole new range of steel products with unique properties. They built continuous annealing (CA) lines to allow multiple coils welded together to form one continuous coil that moved from start to finish at one constant speed. Along the line, sections with different time/temperature values were constructed to modify the steel microstructure and properties. These CA lines represent a major factor in the development of advanced high-strength steels (AHSS).